SATA / SSD Hard Drive Duplicator The M3100-8 is a professional hard drive duplicator system that performs fast parallel duplication of SATA & SAS devices. IMI Smart Copy function copies only the used portions of a master device to the target devices. 7" Touch screen display allows fast and easy stand-alone duplication. Easy to use intuitive menu system provides quick and easy job set-up, simply choose an operation from the touch screen menu and you are up and running. M3100-8 offers sector to sector copy meaning that the target drives are 100% identical to the original master drive. Includes the best and most reliable verification process possible by performing a check on the target drive using a 'bit-by-bit' verification against the master. Auto verification using CRC32 & MD5 check. The M3100 supports all SATA form factors including 3.5", 2.5", 1.8", MO-297, MO-300 and custom Hard Drives. Can be run either standalone from the easy to use Touch screen menu or via the built in PC allowing user defined test and duplication jobs. Removable adapter modules allowing quick and easy configuration changes. Through its unique design, the M3100 allows you to write your own scripts and adapt the system to your specific needs in your production environment. 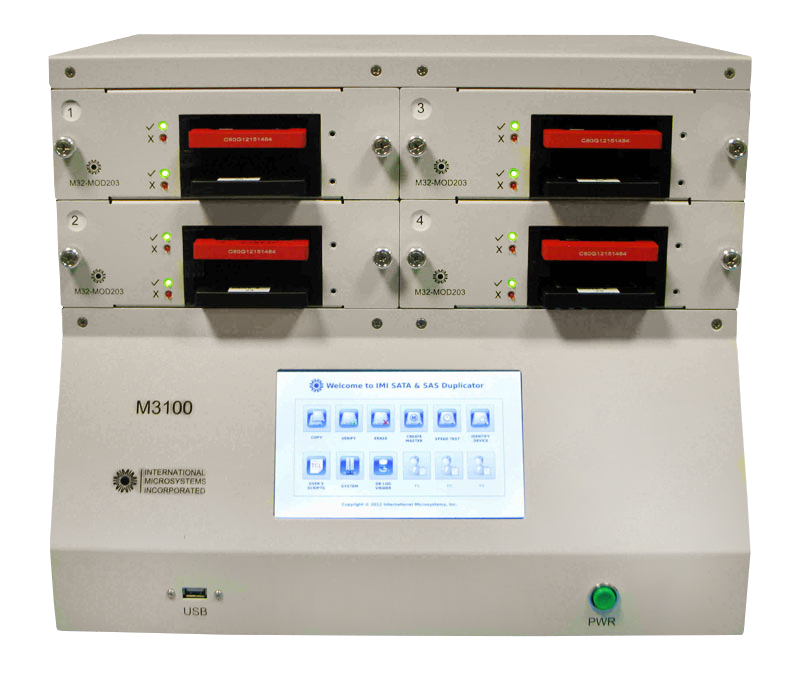 The M3100 Hard Drive duplicator and SSD Duplicator is High speed and designed to be used in medium to high production environments.